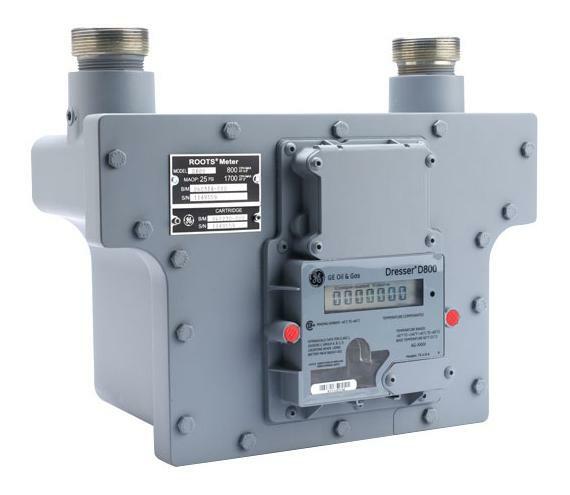 Rotary displacement gas meters can be employed across a wide range of applications, from residential through commercial and industrial. Their simple design provides predictable accuracy and long term durability. A rotary displacement meter is comprised of a pressure containing shell or housing, enclosing two rotating impellers. The impellers have a cross section similar to a figure 8 and rotate in opposing directions within the housing. Gas flows through the chambers created by the rotating impellers. The displacement volume of the rotating impellers is known, so a count of the shaft rotations can be converted into a volumetric flow value. The machining of the housing and impellers is precise and disallows contact among those moving parts. This, of course, contributes to the longevity of the device. Upstream filtration is advisable to prevent entrance of any foreign particulate matter into the meter which could damage the impeller or housing surfaces. Share your gas metering applications and challenges with a product specialist, combining your facilities and process knowledge with their product application expertise to develop effective solutions. Rotary Gas Meters for Industrial and Commercial Applications from Classic Controls, Inc.